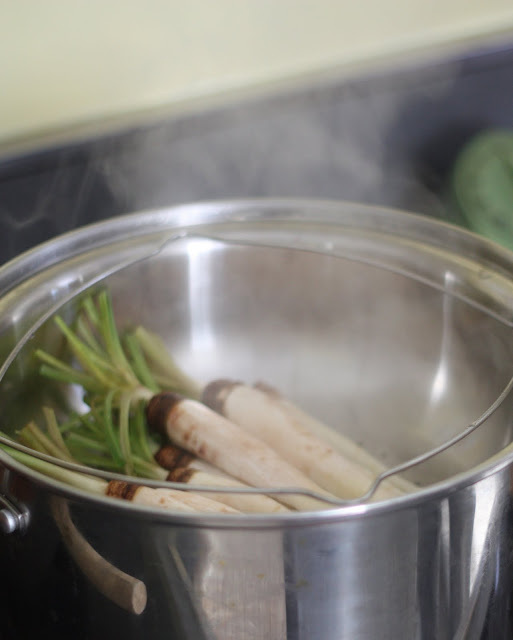 Salsify — heard of it? I hadn't and as I type this, my computer is highlighting the word as being spelled wrong, offering up suggestions as if I meant falsify, falsity? No, I mean salsify, the vegetable — root vegetable to be exact. 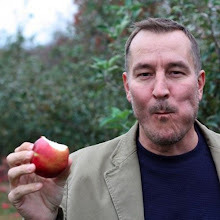 Well, I had to do my research after Suzi Lilly from Farm to family called and let me know she'd come across a great crop and had it available at the market. Many shoppers had been inquiring about what on the outside appears to be an ugly vegetable, and ask how it tastes and how to prepare it? Her challenge to me was to not only educate myself but also educate the readers of E.A.T.. What a worthy education as it was especially a tasty veggie on the palate. First lets address the nutritional value and as it states this food is low in Sodium, and very low in Cholesterol. It is also a good source of Dietary Fiber, Vitamin C, Riboflavin, Vitamin B6, Potassium and Manganese. In my research most were stating it is fibrous and to steam the vegetable before roasting (the method I chose). 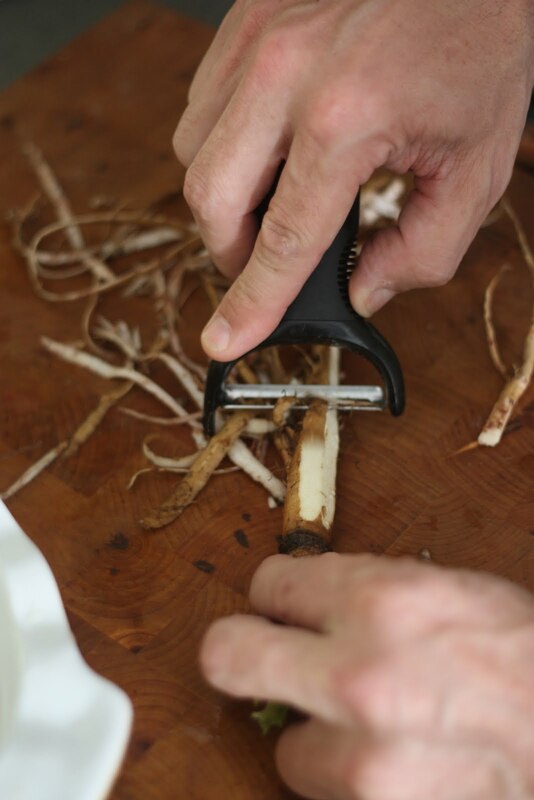 Peel salsify with a vegetable peeler. Turn back the brown stalks until the green stalks are exposed. Trim these as desired. If you are not going to use the stalks immediately after peeling place in a lemon water bath as to avoid discoloration. Stem the stalks for 10 minutes. Place in a roasting pan and sprinkle with lemon zest and ginger. Cover with foil and bake at 350 degrees for about 40 minutes. Remove from oven spread butter and drizzle with honey. Turning the heat up to 400 degrees roast uncovered for about 10 minutes. Serve immediately. There are other recipes like grating salsify and mixing with potatoes to create pancakes or dicing and roasting with other root vegetables. No matter what you choose I would highly recommend adding this vegetable to the rotation and impress your guests with a vegetable they may very well have never have heard of. So have you or do you salsify? 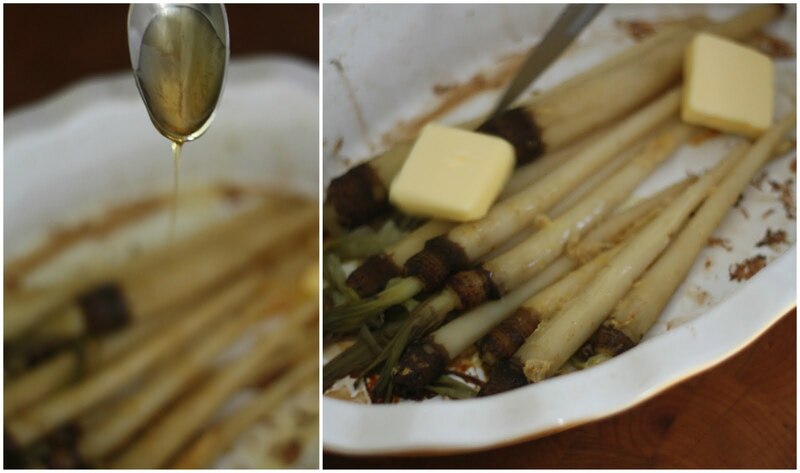 We call them "winter asparagus" and prepare them just as you did and serve them with a light sauce hollandaise. @Cuisine de Provence I do not know where this vegetable has been in my cooking but I am so happy I have now come across it. Ooooh this looks very interesting! I'll have to try this with the local ginger we have now!! This looks great. Will have to give it a try! 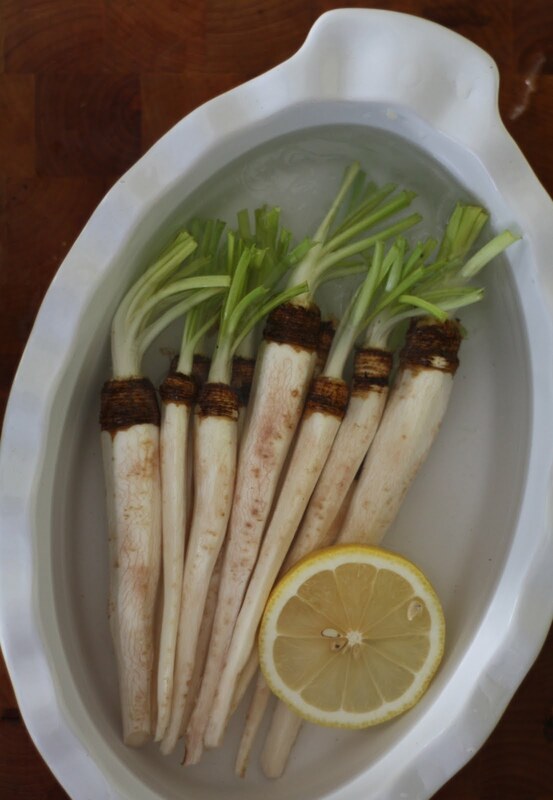 I've never heard of or tasted salsify, but it looks similar to parsnips. I'll have to look for it at the market this season. It was great to run into you and Mary at the SOTJ market today. Have a great weekend! 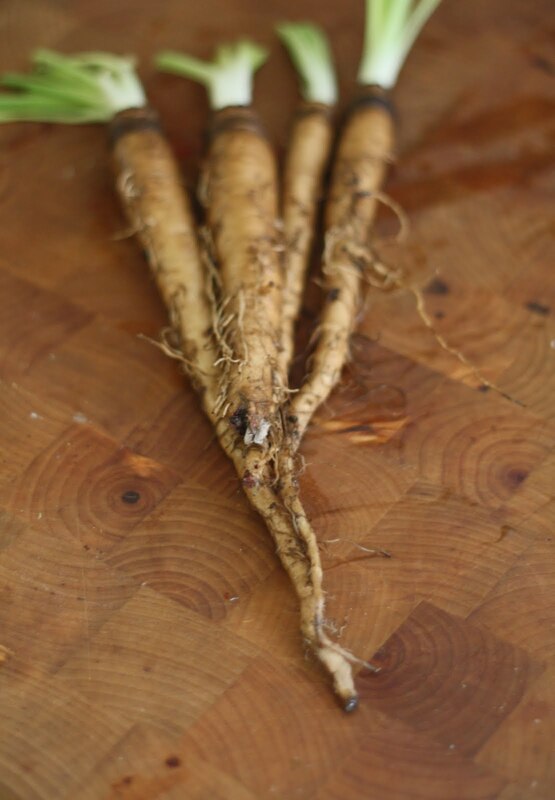 Salsify also adds a great flavor to mashed potatoes. I will have to try that! Thanks for stopping by.